Cleaning… In iOS5, the cache directory used by many applications, including Instapaper, to store downloaded data now gets periodically deleted by the operating system. Today I learned Rdio is affected by this same fatal bug; even though I had 10GB or more free on my iPhone, my downloaded music was nuked sometime in the last 24 hours (and Instapaper articles too). Yet my podcasts in iTunes persist and I have a suspicious feeling this policy doesn’t apply to applications developed by Apple. Streaming isn’t going to work for the amount of time I’m out of country this year. Epic fail. Listening state persists independent of whether you’re using the web app or desktop app. Taking an action in one immediate affects the state of the other. 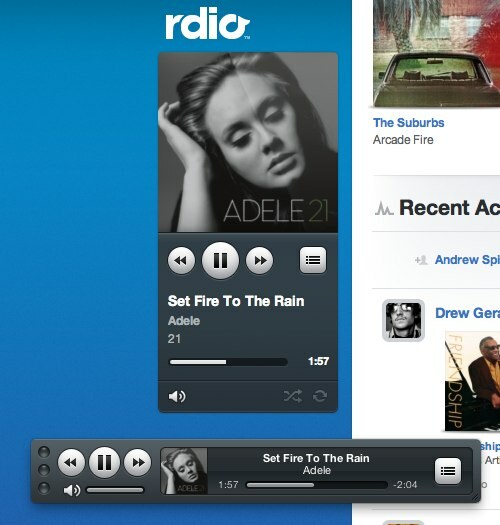 It’s user experience details like this that have kept me perma-awestruck about Rdio since Friday, and why I’m tempted to throw iTunes completely out the window.